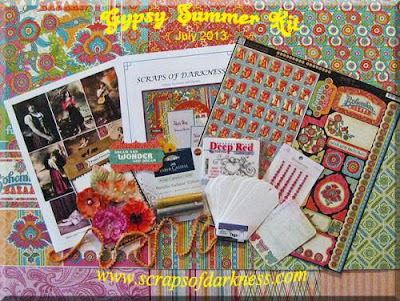 Hi My Friends, Today I'm sharing a DT layout using the Scraps of Darkness July Kit "Gypsy Summer". This is a fun kit full of bright and fun Graphic 45 "Bohemian Bazaar Paper Collection" along with some great coordinating papers from My Mind's Eye's "Collectable" Paper Collection. This is a layout using some photos of my niece Savoie at one of their favorite swimming holes up in Idaho, I loved the photos and couldn't wait to use them!! 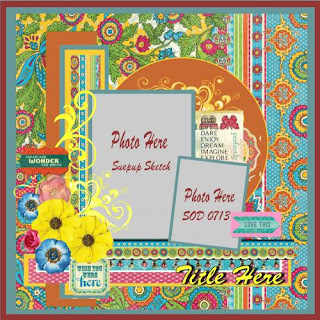 I used the G45 Bohemian Bazaar Paper collection along with some papers from the "Collectable" paper collection from My Mind's Eye. The small tag pocket is from G45 and has three journaling cards in it for her to use. I also used some Tim Holtz stamps and distress inks. I'll have some more projects done in the few days before I leave for Lake Tahoe where we're getting married on a yacht on July 30th, so excited!!!! 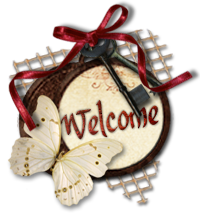 Thanks for taking a peek and we hope you will love this carefree and fun collection as much as we loved creating with it!!! 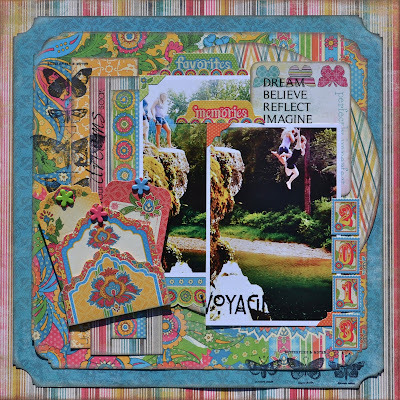 Here's a photo of the beautiful and colorful July Kit "Gypsy Summer".